From roadway level, Hartford bound drivers on I-84 can’t see the nine graceful granite arches they pass over as they cross the Connecticut River each morning. In fact, due to a series of levees and the location of other highways, the most dramatic views of Connecticut’s most unique bridge have been obscured for decades. Hartford’s River Recapture Project has helped to change that, at least for those who venture off the highway and onto the pathways that now line the banks of the Connecticut River north of the new Convention and Science Centers. Riverside Park on the west bank and Great River Park to the east include paved walkways from which one can best view the one hundred year-old span. Walkers, bikers and joggers who venture just north of the Mortensen Riverfront Plaza get the closest look. Runners in the annual Hartford marathon pass under span’s first granite arch, near mile 24. If you can see over the railing, the bridge is also visible from the Founder’s Bridge, which crosses the river several hundred yards downstream. The designers of the 1192-foot long Neo-Classic structure never meant it to be hidden from view, far from it. During the 19th Century a wooden span had connected Morgan Street in Hartford with Connecticut Avenue in East Hartford. The 974 foot-long “Old Hartford Toll Bridge” was constructed in 1818 and for 75 years served as a primary route for horse drawn traffic. In 1885 a Trolley line was added.2 But, far from the picturesque covered bridge one normally associates with New England, the structure was long and ugly and in May 1895, a spectacular fire burned it to the waterline. Backed by civic groups who saw an opportunity to create a monumental structure, construction on a permanent “Hartford Bridge” began in 1903. Designed by Edward Dwight Graves, it would be the largest and one of the last major stone arch bridges ever built in New England. At a time when various steel truss and suspension bridge designs were in vogue, the decision to use the more traditional stone arch method was in large part aesthetic. However, stone arch bridges are also stronger and last longer. They never rust or need repainting. Morgan Street and other nearby boulevards were widened and buildings removed to enhance the view that civic leaders looked upon with tremendous pride. Its graceful stone arches spanned up to 119 feet each, longer than any others in the state. At a total price tag of $3 million it was the most expensive bridge in Connecticut, costing half-million dollars more than the state capitol building itself. Constructed from over 100,000 cubic yards of grey and pink granite, each ten-ton block was cut to remarkable tolerances of within a 3/8ths of an inch. Construction was not without risks, probably the most dangerous of all jobs being that of “sandhogs,” the men who worked up to 60 feet under the river to dig the caisson chambers that served as the base for each granite arch. These unsung laborers came primarily from Hartford’s African-American community. Risking ‘the bends’, cave-ins and flooding, they earned $2.50 for eight backbreaking hours of work a day. All of Hartford turned out to celebrate when the bridge finally opened on October 6, 1908. 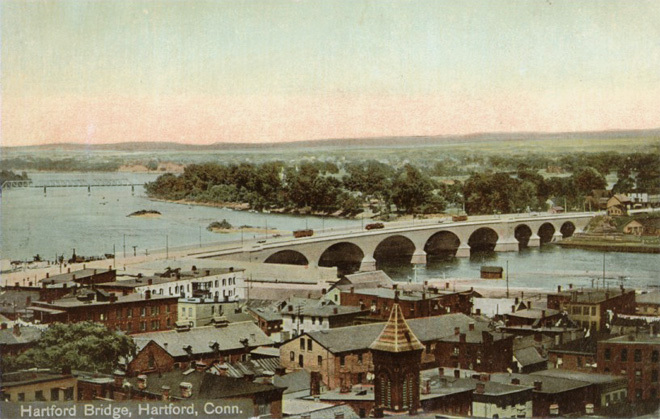 The Hartford Courant reported that over 10,000 marchers including several thousand flag waving school children, floats, speeches, sermons, re-enactments of the founding of Hartford, and fireworks were all part of the “Bridge Week” celebration. The most recognized participant was Senator Morgan C. Bulkeley, president of the bridge commission. After his death in 1922, the span was re-named for Bulkeley. The former Hartford Mayor, U.S. Senator, and Connecticut Governor had been instrumental in the bridge’s planning. A longtime president of the Hartford based Aetna Insurance Company; Bulkeley was also the first president of baseball’s National League and is the only man enshrined both in Connecticut’s Hall of Governors in Hartford and in Baseball’s Hall of Fame in Cooperstown. 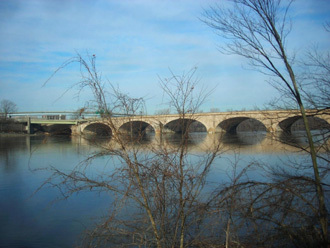 As horse and buggy gave way to the automobile, the Bulkeley Bridge became the most important vehicular span in the state. Following a pair of horrific floods in 1936 and 1938 a series of levees were constructed along the banks of the Connecticut River, beginning Hartford’s retreat from the waterfront and partially obscuring views of the bridge. In the late 1940’s, work began on what is now I-84, Connecticut’s main east-west corridor. Morgan Street and the carefully laid out approaches to the bridge were moved or covered first by the new interstate and later by its intersection with I-91. In 1964 the bridge was widened to its present eight lanes. Until River Recapture, it remained hidden from view behind the flood control dikes and highways. Few one hundred year old bridges, built for horses and carriages could be adapted for use by a modern interstate highway. 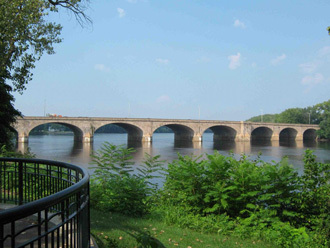 The Bulkeley Bridge, unseen by most who cross it each day, is the exception, carrying I-84, Rte 44 and Rte 6 across the Connecticut River. Additional photos and stories about Connecticut’s past can be found in author Sam L. Rothman’s Historic Photos of Connecticut (Turner Publishing).